EDIT: I just spoke to my mother, who tells me Dad was on a stool, but he frequently stood throughout the presentation and referenced a chalkboard that he was using to describe all the timelines and things that he discusses in the speech. So there’s a visual element to this fireside that was not recorded. President Henry B. Eyring, who was the concluding speaker at my father’s funeral in Salt Lake City, went even further. 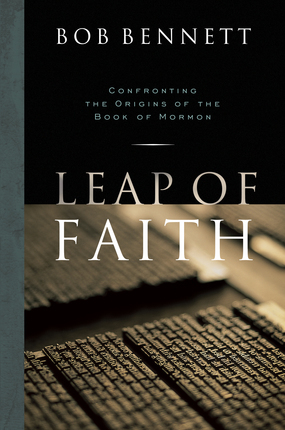 At the funeral, he called Leap of Faith “the best defense of the Book of Mormon ever written.” I think that would make a pretty good blurb on the back of the paperback edition. If you’re a purist who wants to hear Dad’s words for yourself, I’ve embedded the audio in this post. If you’d like to take a stab at your own transcription, feel free. The recording also started just a little late, so it sounds as if he began by saying that most of the visions and stories of Joseph Smith can be dismissed fairly easily, but the Book of Mormon cannot. We join the fireside, already in progress. … dismiss the witnesses; they were just bamboozled by his charisma. (Actually, we think he was kind of dull, but to make the case that he confused everybody, we have to change our description of him depending on what it is we want to attack with respect to his background.) We can go through all of the rest of that outcome with a complete explanation – and then there’s the Book of Mormon. The Book of Mormon exists. (Now, that seems fairly fundamental.) That means somebody wrote it. It didn’t come out of an imagination of something into a speech. Somebody wrote it down. Somebody created it before 1829. You have to explain who wrote it. It’s here. It’s physical. It cannot be waved away the way some of the descriptions of visions and other things could be waved away. If we step back and think of it for just moment in something other than straight religious terms, but marketing terms, we have to say, “What a genius decision if we want to launch this new religion to give it a book that cannot be waved away.” It has to be examined in terms of answering the fundamental question – who wrote it? You can’t get around that question. You can’t avoid it. Who wrote it? That was not available early on. So we’re going to start out tonight with the desire to find out who wrote it, with the understanding that every book always tells you something about its author. Okay, do we have a 24-year-old anywhere in the crowd? Okay, you just got picked. Stand up. All right, I want to create a forgery of a religious book for my own purposes, and I pick you to write it. You’re 24 years old. That’s how old Joseph Smith was – everyone turn around; take a good look at him, that’s Joseph Smith. That’s how old Joseph Smith was when the Book of Mormon was published. Now let me describe to you what I want in this book. I’ve got it here in an outline kind of form. Actually, I want three books. They’re all going to be crunched together in one volume. I want three books, and here’s the timeline. 600 BC is when you start, and 385 AD is when you die. So you’ve got to fake something – this is coming out in 1829, which is a little bit later than the year 385, so you’re dead. You’re doing all of this a thousand or so years after you die. Okay, that’s kind of a challenge for any author, but you look like a pretty smart 24-year old, so you may be up to this. Now the first book which I have here, I’ve labeled that “Family Journal.” You’re going to write a family journal. That means first person: “I. We.” You’re going to describe what happens in your family, or in this family. Now you’re not just going to sit down and write it straight through. It goes from 600 BC to about 124 BC. And it’s going to be filled primarily with four principal authors. Which means you’ve got change who you are three times. You can start out being Nephi – that’s the name I’ve picked. You can start out being Nephi describing your circumstance, and then you’re going to pass this on to your brother, Jacob, and he’s going to write for a while, and then he’s going to pick a prophet than nobody’s ever heard of called Zenos, and he’s going to write some stuff in there, and then you’re going to fill up the rest of it with quotations from Isaiah, and they’d better be the right quotations, because there are certain points I want to make here. So you’ve got four people. One of them is very easy; that’s Isaiah. You can crib him from the King James Version of the Bible. Now don’t crib him exactly. We want to make some changes along here, because we’ve got some points to make, and the changes will helps us make those points. Okay, are you up for this? Now, at the same time, this fellow Nephi, who we’re going to put at the front of this family history, writes another book simultaneously. This one he calls the Large Plates of Nephi. This runs all the way from 600 BC on to 325 AD. This is a history. This is not a family journal. This is not first person. This is third person. Nephi writes a little bit of the history in the Small Plates, the family stuff is all in there, but here in the Large Plates are the kings, and the wars, and the government, and all of the logistics of a major society. So that when Nephi dies, then the next historian comes along, and then the next historian, and they just pass this record on down, and on down, and on down, until the final guy who gets it, who’s name is Mormon, is going to summarize it. So, you’re Nephi. Now you’re Mormon. And you’re going to go back over a thousand years of history and describe the wars, and the rulers, and the government changes, and all of the rest of that. And this time, it’s not just four people who are going to be talking. There’s a whole bunch of people who are going to be talking all the way through. A thousand years. Okay, now, in addition, I want a third history. We have no idea when it began, but I won’t hold you to a date, because we’ll tie it to the Tower of Babel. So 3,000 B.C. Pick a date. Anytime that’s convenient. You’ve got to go forward with this history, and this history ends about the same time the other one does, as these people destroy themselves. Now the problem is that the folks in the first history all start out in Jerusalem. They’re all Jews. Hebrews. Israelis. Pick whatever name. They all start out in Jerusalem, so through their history, everything will have the flavor of the culture in which they were born. You can’t deviate from that. Yet the folks in the last history have nothing whatever to do with Jerusalem, and you can’t allow any of the first history to leak into this one. This one has to be completely different. Oh, by the way, we’re going to have to erase the first 116 pages of the history in the Large Plates of Nephi, because they were lost. So you have to start the history about the same time these other two begin, which means it has to come across like a movie that you have stepped into twenty minutes after it started, and you have no idea who any of the people are. That’s the Book of Mormon. And then suddenly King Benjamin is talking. Who is King Benjamin? We don’t know. Ask the 116 pages. And it gets very difficult when you get into this for you to be a forger, because Mormon, who is reading all of this history coming from all of these other folks, is quoting them at length. So you can’t just pretend to be Mormon. You have to pretend to be King Benjamin. And if you want to make this thing look real, King Benjamin cannot sound like Mormon, nor can he sound like Alma. Alma is the most quoted of all of the people that Mormon uses to quote directly. There’s first person in this, but it’s never Mormon. It’s always the people he’s quoting. And so Alma takes up 36 pages, and if you read Alma carefully, he doesn’t sound like King Benjamin. He doesn’t even sound like Amulek, who is his missionary companion. The two of them are out there together, and Alma has one way of preaching, and Amulek has a different way of preaching. He doesn’t sound like Abinadi, who’s standing there quoting the Law of Moses. You go through all of these – you start with Abinadi, and then you’ve got Benjamin, and then you’ve got Alma, and then you’ve got Amulek, and you’ve got Samuel the Lamanite, and you’ve got Zeniff, and you’ve got Helaman, and Helaman doesn’t give any sermons at all. Helaman just tells you about the wars. I’m sure Mormon would love to quote some sermons from Helaman, but Helaman didn’t give him any. Quick aside: Does it bother you that Alma doesn’t sound like Amulek? Does it bother you that Elder Holland doesn’t sound like Elder Oaks? They’re both testifying of the same thing, but each is responding to his own experiences. And Elder Holland is a great classroom teacher whose lots of fun to listen to and tells wonderful stories, and Elder Oaks is a former State Supreme Court Justice who lays it out in a kind [of way] that lawyers like Elder Hardy can understand. And you’re not through yet. Because it all gets down to Mormon, and he’s completed all of this, and he gets killed in 385 [AD], and his son Moroni comes along. Mormon has completely neglected this third book about the people from the tower of Babel. And Moroni, with plenty of time on his hands, decides, “I’ll add that to Dad’s record.” So Moroni sits down and gives us this record. Well, these people are really weird. They have kings that rule in captivity through their whole lives, and they father children in the captivity, and then the children try to overthrow the other king, and they have weird names that don’t [make sense.] Why in the world is that there? Because Moroni decided it was important to put there. [That’s odd] from our point of view, but you’re the forger, my instructions are to you that I want this in there. Now, you’re 24 years old, which means that you’ve got to be doing this before you get to that age. And, by the way, you write a little bit yourself. And here come the computers. You don’t sound like King Benjamin. The writing that Joseph Smith put into the first edition of the Book of Mormon describing what happened to the 116 pages – we don’t have that anymore; we don’t put them in the Book of Mormon anymore; people apparently don’t pay much attention to them anymore – but Joseph felt strongly about it. So strongly that he put it right up front. And you read that paragraph, where he describes that, and you say, “Whoever wrote that didn’t write anything in the Book of Mormon.” There is no connection. Well, all right, here come the computers. You have to have been such a good forger in making up all of these different personalities and changing the way they talk that the computers are fooled. And the computers say all of these speeches in this one, all of these sermons, are by different people, and Joseph Smith is not one of them. We checked Joseph Smith against Alma – nope. Joseph Smith didn’t write Alma. So my thesis to you is if you’re going to approach the Book of Mormon on a strictly intellectual basis rather than on a spiritual basis and just analyze it for what it is and what it says, rejecting Joseph Smith as the author of the Book of Mormon is the way to go. I would think in a court of law, beyond a reasonable doubt, you can demonstrate that Joseph Smith did not write the Book of Mormon. Joseph Smith, I have great confidence in your ability, but Joseph Smith didn’t write all these things, and put them all together, and have them hold together. Now, you talk about forgery, and I’ve had some experience with forgery. And I wrote a book asking the question, “Is the Book of Mormon a forgery?” And in the process, I analyzed for my readers, “What is forgery?” And there are three tests for forgery, traditionally three tests. There are internal tests, and there are external tests. And then there is the fundamental question of motive. Well, I think I’ve demonstrated with this that the Book of Mormon passes the internal tests. You can’t look at it and how it’s constructed, and how things relate to each other, and say there’s anything in this that says forgery. Oh, and by the way one of the other things I [need to add] – the longer the forgery, the easier it is to detect. Remember the forgeries of Mark Hofmann that he foisted off on the Church? The Salamander Letter, and all of these kind of things? Very short. Not much to check. Very easy in a very short presentation to see to it that it fits together internally. It can pass the internal test. We want to see whether this forgery passes the internal test. By the way, it’s 535 pages long. That’s not very short. That exposes you to all kinds of possibilities of mistakes if you’re going to write something that long. Truth is the daughter of time. And short is better if you want to make it as a forger. You’re going to find on the right a whole series of things that demonstrate that the Book of Mormon is nonsense – external evidence this is nonsense. And over here on the left, well, all you’ve got is Joseph’s word, and the word of some of his associates, the witnesses. That’s it. Metal plates? Who writes on metal plates? That’s absurd. Big cities on the American continent? Everybody knows the Indians are nomads who go around with teepees and move all the time, and the idea of cities – no! That’s nonsense! This whole thing is crazy. My grandfather used to have an ongoing controversy with one of his business associates who was not a Mormon. He said, “Heber, the Book of Mormon says they built cities out of cement! There’s no cement among the Indians!” My grandfather would say, “If the Book of Mormon says they had cement, they had cement. It’s as easy as that.” Well, you know, they don’t resolve that kind of a controversy. Okay, well, I’ll just a run through a few of them for you. Metal plates? Today, we know that people of the Abrahamic covenant regularly wrote sacred things on metal plates and buried them in the ground for future generations to find and sometimes put them in stone boxes. We have found in Iran the stone box that looks just like the stone box that Joseph Smith describes the plates came in, in which there are metal plates, on which there are engravings, and the plates are exactly as Joseph Smith described the plates for the Book of Mormon, except these plates are a bit bigger. Joseph Smith’s plates were a little smaller. The Darius Plates, as they were called, named after the Syrian king, are a little bit bigger. There are over a hundred, maybe by now two hundred or more, I don’t know if some folks lost count, of examples of people of the Abrahamic covenant writing on plates and burying them. Okay, you’ve got to take that off of this side of the ledger as a statement against the Book of Mormon and move it over to this side, because no one in Joseph Smith’s time knew about the plates except Joseph Smith. Names. Up here, all the people came from Jerusalem, so all of their names in the Book of Mormon should be Jewish names. Names tell you a lot about where people come from. If your named MacGregor, you’ve got Scottish ancestry. If you’re named O’Malley, Irish. The most common name in England? Smith. The most common name in Wales? Jones. What’s the most common name in the Book of Mormon? Anybody got a guess? Ammon. Where did that come from? Well, going back to that family journal, Nephi points out that he had an education. His father provided him with an education, and it’s very clear that his father was a wealthy man. How did you become wealthy in Jerusalem in 600 BC? One really good way to do it was to trade with the Egyptians. Now let’s take Lehi for just a minute. Lehi was married. Let’s assume he got married young by our standards – 17, 18. He began his career, and they had two children, and they named them standard Jewish names: Laman, Lemuel. Same kind of names everybody else used at the time. But he was doing business in Egypt by now, and he knew Egyptian, and he had two more sons, and he named them Sam and Nephi. Now “Sam” is not a contraction of the New England name of Samuel. “Sam” is a perfectly legitimate, stand-alone-by-itself, Egyptian name, and so is Nephi. So, okay, he’s now out of his teens and had his first kids and is now into his twenties and in his career, and he gives his next two sons Egyptian names. Then he get called as a prophet and told to leave and spends his eight years or so wandering in the wilderness and reading the scriptures, and he has two more sons. Now what does he name them? Jacob and Joseph. Two of the most important prophets in the scriptures that he’s reading about. So you’ve got to have some Egyptian names in the Book of Mormon as well as Hebrew names in the Book of Mormon if it’s going to be internally consistent. And the most common name in the Book of Mormon is Ammon. What was the most common name in Egypt in 600 BC? You don’t need any hints. Ammon. Getting down to this third group from the Tower of Babel, and there are no Ammons, and there are no Lemuels. They are Coriantumr or Shiz and a whole bunch of weird names. Do those names ever leak up into the other history? They do. There are some Jaredite names that are in this history. Where did they come from? Well, about the same time that this happened, the last Jaredite makes his way up in to Zarahemla and takes enough culture with him from that world that there are a few Jaredite names from that time forward, nothing prior to that point in the Book of Mormon. Okay, take the names off the ledger on this side. Move them over to this side. This is another demonstration – poetry. Every culture has its own poetry. When you get introduced to a haiku, you know you’re talking to somebody who knows something about Japan. Because nobody writes poems in haiku except the Japanese. Get in 1 Nephi. Read Lehi’s statements to his sons in the Valley of Lemuel. You have desert poetry. Perfect example of desert poetry. Nobody in Joseph Smith’s time knew anything about desert poetry. Move this one over; let’s keep building up on this side all of the good things for the Book of Mormon and keep reducing all those things on the other side. Well, I could ramble on, but we’re getting towards the end and I want to wrap this up. I just have one more statement about the things that have come to light in external evidence. One of the greatest complaints against the Book of Mormon by its critics is archaeology. There is no dependable Book of Mormon site anywhere in the Americas that can be identified as a Book of Mormon city by anybody other than a Book of Mormon archaeologist. Mormons think they’ve found cities that correspond to the Book of Mormon, but they can’t convince any other archaeologist that they’ve done so. So that stays over here on the list of external evidence that the Book of Mormon is not true. Guys, you’re looking in the wrong place. The Book of Mormon doesn’t give you enough information to find an an archaeological site in the Americas with any kind of accuracy. The family journal, that first part up there, gives you clear information about the family wandering on the Arabian peninsula. And that’s the one of the few places in the world that probably still looks exactly today like it did in 600 BC. There aren’t any superhighways across the Arabian peninsula. They just leave it alone. It’s just the way it was. And if you follow Nephi’s description of their journeys in the Arabian peninsula exactly, you find a gold mine. Why do you need a gold mine? Gold plates. That’s where we get the gold. They came across a city, and the Hebrews do not use vowels. The archaeologists uncovered right about where Nephi would have to had to have been where Ishmael died and they buried him; they buried him in a town called Nahom. N-A-H-O-M. Which was a burial site. Archaeologists within the last fifteen years have found the site on the Arabian peninsula right about where Nephi said Nahom would be, and they have uncovered the description of the name of the town, and it says “NHM.” And the Hebrews don’t use vowels. This is an archaeological bullseye! You’re out there looking under the street light, guys, when the archeology of the Arabian peninsula makes it very clear that you should be looking in the Arabian peninsula for validation of Nephi’s description of where they went. If you do, you’ll find the Land Bountiful, where there’s plenty of wood to build a ship right where Nephi said he would. You turn directly east, and it takes you right smack into an area that would be similar to the Land Bountiful, and nobody in Joseph Smith’s time had ever heard of it. Well, I could go on and on and on. The external evidence is piling up and piling up on this side of the ledger and shrinking and shrinking on this side of the ledger. Truth is the daughter of time, and the longer your forgery, the more likely it is to be uncovered. Here we are, 180 years since the publishing of the Book of Mormon with far more evidence that says it’s genuine than you had at the time it was published. All of this is interesting, and it’s fun, and it’s important for us to know as we get attacked by those who are leaving the Church by telling Joseph Smith was a fraud, the Book of Mormon is a forgery, and so on – important for us to have the tools. Elder Ballard said we need to gather this now. We didn’t used to have to have this. We do now. But it’s not the main point. You don’t need to know about the location of Nahom. You don’t need to know about the proliferation of plates. You don’t need to understand about ancient names in order to live a more successful and worthwhile life. You need to know about the Lord Jesus Christ. Now what is its message? And so we have to add a fourth criteria to – I skipped over “motive” because of the time. Okay, you get the point anyway. Yeah, internal evidence, external evidence, what’s the motive, but if the Book of Mormon does not pass this last test, it is not valid. And the last test is relevance. In our lives. In our day. You know how much work that represents? We had our 24-year-old going over this. As I got through all of this writing my book, I was interviewed on a closed-circuit TV in Deseret Book, and I got asked a question that I had not anticipated and not thought about. Moroni? Lehi? I had never thought about that. But she asked the question. I got the answer. I’m not saying it’s inspiration; I’m saying it’s me. I’m not saying that anybody else has to share it. How much work was that? How much work was it to bring it to us, and why do we have it? Because it truly is another testament of Jesus Christ. Go back to the Isaiah passages that are in the family journal that Nephi and his brother Jacob pulled out and put there. What do they talk about? Two things. (This is in Isaiah, now.) The gathering of Israel, and the Last Days. The coming of the Messiah to Israel. That is a message as old as human history that God has wanted all of his children to receive. He foresaw the time where we live where that message would ignored. Ridiculed. People would turn their backs. Karen Armstrong, who is a prolific writer on Christianity and Islam, she and I got in a conversation one day. We talked about the state of Christianity in Europe, and she said, “If you say to anybody in Europe today that you’re a religious person, you’re treated with disdain.” Europe is this post-Christian Europe. This is the world in which we live. This is the world in which we preach the Gospel. This is the world to which we must bring the message of the reality of Jesus Christ, and the Lord has given us a tool with which to do it. It requires everybody to recognize this exists. This is here. This is not some pretty speech. This is real. Read the Book of Mormon. I won’t tell the Proctor story in any kind of detail, but I will close with it. Elder Hardy knew the Proctors. When we called on Bill and Marian Proctor for the first meeting, we had left a Book of Mormon with Marian. We had gone tracting that morning, came back that night. He was reading it – Bill Proctor was reading the book by the fire, which I took as a good sign. He didn’t need any internal or external validations, or any intellectual analysis. All he needed was an open heart and the presence of the Holy Ghost, and he knew. The Book of Mormon can survive any attack by any enemy of the Church because the Proctor example has been repeated millions of times, in every culture, in every country, all around the world. The Lord’s wisdom in having Mormon do all that work, and having Moroni deliver those plates to Joseph Smith, and then the translation, is validated again and again. The Book of Mormon is, indeed, another witness of Jesus Christ, and a precious gift that God has given to warn us. Loved this! I also really enjoyed the pdf of your CES letter reply, which is how I ended up here. You are hilarious, fun, and spot on. Thanks for all the work defending the faith.